'Court' 1993 belongs to a series of coolly coloured and semi-abstract paintings by Melbourne-based artist Brent Harris. These works were the product of Harris's experimentation with pictorial space as well as his investigation into abstract concepts of space put forward by Deleuze and Guatteri in their seminal post-structuralist text 'A Thousand Plateaus' (1980). 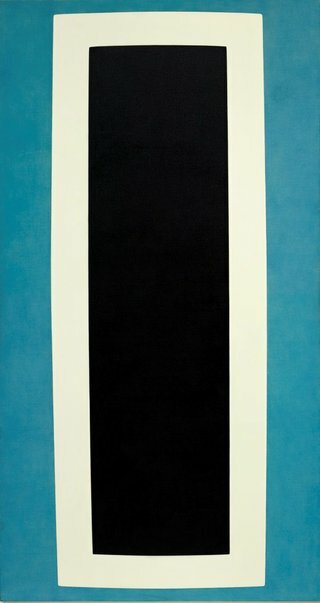 Harris's 'Court' is a tall and narrow picture featuring margins stained cerulean blue and a bulbous, concentric centre painted black and white. Its human scale and swollen forms are relative to the body and designed to foster an unconscious engagement between the work and its viewer. Indeed, Harris has acknowledged that 'Court' might represent: 'a space to lay down in, or lay a body in, or a doorway/portal to move through'.